Static GK is one of the important section in both Government Sector and Bank related Exams. 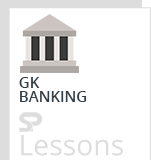 In the static GK, GK Banking is one of the important topic. The article Pradhan Mantri MUDRA Yojana presents the key points of PMMY and MUDRA. The article Pradhan Mantri MUDRA Yojana can help the students and aspirants to perform well in the exams like IBPS PO, SO, Clerk, SBI, RRB, etc. In the Union Budget for FY 2015-16, the formation of MUDRA Bank was announced, and was launched by PM Modi on 08 April 2015. To be an integrated financial and support per excellent bench marker with global best practices and standards. To create an inclusive, sustainable and value based entrepreneurial culture. To achieve success through the support from the partner institutions. Finally, to create an ecosystem of growth and to succeed in all aspects of the micro processors sectors. MUDRA was set up by the Government of India (GoI). The authorized capital of MUDRA is 1000 Cr. Paid up capital is 750 Cr. Both authorized and Paid up Capital fully subscribed by SIDBI. It will be responsible for developing and refinancing all Micro-enterprises sector. It will partner with Banks, MFIs and other lending institutions at state level / regional level. The main aim of MUDRA was to provide support to the micro enterprise sector in the country. The primary objective of MUDRA was to develop the the micro enterprise sector in the Country. 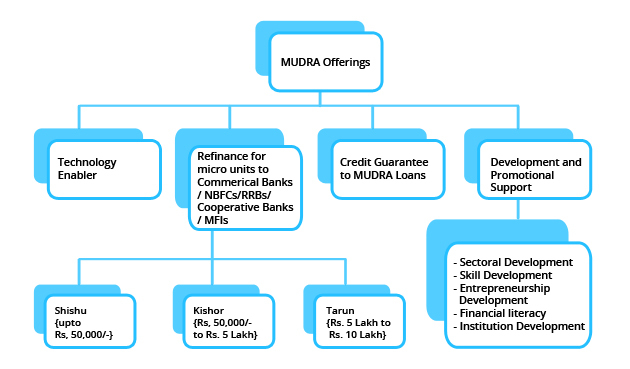 Mudra wants to extend various supports like finance in the form of refinance. It will provide refinance support, monitor the PMMY data by managing the web portal, facilitate offering guarantees for loans granted under PMMY and take up other activities assignedto it from time to time. MUDRA has put in place a monitoring portal which captures the data on lending under PMMY, in a granular fashion. It’s primary responsibility is to provide funding to nearly 5.8 crore Non-Corporate Small Business Sector (NCSB) units of the country through various Last Mile Financial Institutions like Banks, NBFCs and MFIs. PMMY is a scheme launched by PM Modi on April 8, 2015 for providing loans upto 10 lakh to the non-corporate, non-farm small/micro enterprises. These loans are classified as MUDRA loans under PMMY. These loans to be given by Commercial Banks, RRBs, Small Finance Banks, Cooperative Banks, MFIs and NBFCs. The borrower can approach any of the lending institutions mentioned above or can apply online through this portal. Mudra loan is extended for a variety of purposes which provides income generation and employment creation in Manufacturing, Services, Retail and Agri. Under the aegis of Pradhan Mantri Mudra Yojana (PMMY), MUDRA has created products / schemes. d. Micro Credit Scheme (MCS) for loans upto 1 lakh finance through MFIs. e. Refinance Scheme for Commercial Banks / Regional Rural Banks (RRBs) / Scheduled Co-operative Banks. Different banks like Commercial Banks, Regional Rural Banks and Scheduled Cooperative Banks are eligible to avail of refinance support from MUDRA for financing micro enterprise activities. The refinance is available for term loan and working capital loans, upto an amount of Rs. 10 lakh per unit. 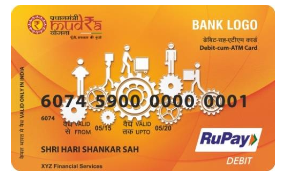 MUDRA Card is an innovative product which provides working capital facility as a cash credit arrangement. The borrower can make use of MUDRA card in multiple withdrawal and credit facilities, so as to manage the working capital limit efficiently and keep the interest burden minimum. MUDRA card will also help in digitalization of MUDRA transactions and creating credit history for the borrower. MUDRA has emerged as a grant success in terms of the number of beneficiaries and amount sanctioned. In the first year, 2015-16, about 1.5 crore new entrepreneurs have got support from banks and microfinance institutions (MFIs) to set up small businesses under. Overall, 3.5 crore new as well as existing entrepreneurs have been sanctioned loans under PMMY which is the main programme under MUDRA. Women entrepreneurs account for about 78 per cent (or 2.52 crore) of the total number of borrowers. During the first year, Rs 1.2 lakh crore has been sanctioned under the scheme and the government’s target is Rs 1.8 lakh crore for 2016-17. The data captured by MUDRA shows that almost 50 percent of the loans under PMMY have been taken by new enterprises. SIDBI is a development financial institution with multiple functions for the MSMEs (Micro, Small and Medium Enterprises) including financing and development responsibilities. It was established in 1990 it has become the principal financial institution for the promotion, financing and development of MSMEs. SIDBI gives refinancing as well as direct financing support to firms. Previously, it was the SIBDI that provided indirect loans to small units. The MUDRA aims to give loans below Rs 10 lakh. Micro units are the domain of MUDRA. Under the existing arrangement, SIDBI gives loans for higher amounts. Hence, MUDRA is established as a subsidiary of SIDBI. MUDRA loans i.e. loans upto Rs. 10 lakh, have been made collateral free, as per the RBI norms for the Micro units.